Big thanks to everyone who came along and trained with us last week – and a million more big thankyous to everyone who has taken on our request to SHARE our social media ‘stuff’ and help us grow the family at R1. Has it led to an immediate increase in clients? Well, no…but it has helped widen our ‘reach’ and that can only help us in the long-term. As I noted, there are a lot of challenges in our business at the moment (and yes, most are directly related to meeting the costs associated with the expansion), but these are 100% not insurmountable. 6am Functional Fitness Classes. I understand that a number of people have said that whilst 5:30am classes were ‘GOOD’, 6am sessions are ‘too late’…so they have rolled back to 5am. That is all good – and I get it – but the fact remains 6am Boxing is still our busiest class of the day…so if people can Box at 6am they can 100% Funky Fit at the same time…we just need to find those people. 10am Functional Fitness sessions. As noted when we first scheduled these, if 9:15am is a ‘good time’ for people, then there is no reason that 10am shouldn’t also be a ‘good time’…Funky Fit is an awesome session (and we have clearly put together a pretty amazing environment to conduct it it! )…we just need to find the people. Pretty much ALL of our evening classes in BOTH GYMS. This is a bit of a funny one to me – once-upon-a-time attendance at afternoon sessions would surpass the mornings…and it wasn’t even close. 5pm would be busier than 6am…hell, 6pm would be busier than 6am. These days afternoon classes in the Boxing gym are ‘solid’…afternoons in the Strength gym are a bit less than that…we have heaps of capacity to add numbers to both gyms. We have some awesome classes running at the moment. The stuff happening in Boxing with ‘Guest’ programmers (Lauren is writing all the classes this week) will add even more variety to some session which (to me anyway) have just been so good lately…and the Functional Fitness program (which I cannot claim credit for – it is a subscription service we follow from boxprogramming.com)…and the barbell club and the awesome Hammer Time (teething problems or no, such a great concept and workout)…what we need to do is get a few more people in the gym benefiting from all this great stuff! Speaking of great stuff, I have done quite a few health checks lately – which is a good thing by the way – and, whilst it is true everyone is different it really is hard to put into words how similar most of us are. Essentially, most of us would seem to know the value of cutting back on carbohydrates, desserts, sweets, cheat meals, booze and a long list of other things. So….okay, then: Decrease those things! I must say, that was easy to type. Easy to type and hard to do. I guess that ultimately most of the issues that MOST of us have is that to make progress we have to DECREASE (that word will come back) or STOP (so will that one) things that are “mindless habits” – and we need to STOP/DECREASE more than we need to START/INCREASE because we are already doing a fair bit right…I have a few ideas about dealing with those by the way – and it is part of the “No-one lays away dreaming of Broccoli approach to food management – empty your cupboards and home of all the junk food that is in it now and never buy any again. Problem solved? Weill, the problem is that DECREASING and STOPPING are both actually pretty hard. Now I’ve been reading again – this time I am (re-)reading “NOW WHAT? The On-going Pursuit of Improved Performance” by fitness industry legend Dan John and in it he references the concept of ‘PIRATE MAPS’. Now he attributes the concept to a guy called Pat Flynn – but he in turn sort of ‘fobs it off’ as ‘undetected plagiarism’ in an article that he has written on the Chronicles of Strength website (https://www.chroniclesofstrength.com/there-are-shortcuts-to-your-goals/). 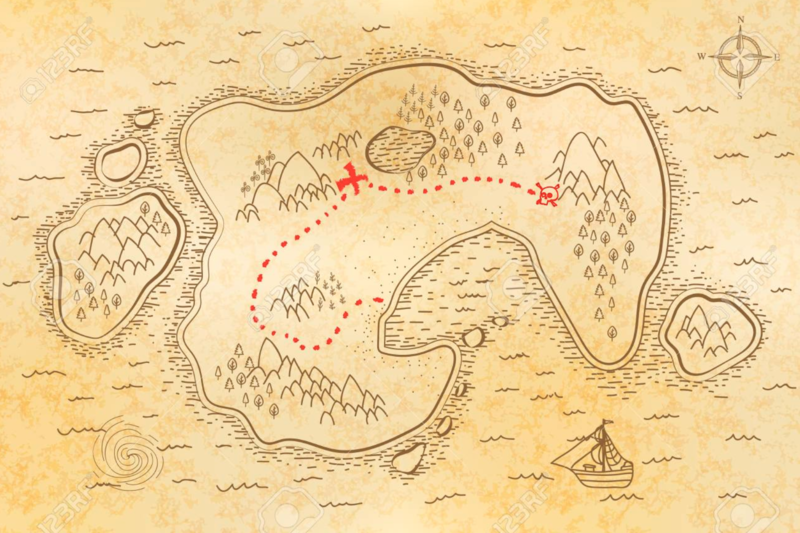 In any case – whether I should be attributing this idea to Pat Flynn or not, the concept is that a Pirate Map is something that explains the EXACT steps from point A to the BURIED TREASURE. Or, from where you are now to where you want to be. If you think back to the stories you read as a kid, the treasure was always buried 6-steps due south of the palm tree – and the palm tree was 25 steps to the west of the flat topped rock (etc). Flynn’s point was that you wouldn’t be complaining (if you were a pirate) of the simplicity or otherwise of a map leading to buried treasure. In fact, you would value it (or despise it) in degree to how simple it is (or isn’t). Because if you’re hunting for buried treasure, complication is the last thing you want. Eat fewer cheat meals (Decrease). Watch less TV / play less computer games (Decrease). Stop snacking between meals (STOP). I think all of us would agree that this is the simplest Pirate Map ever…but when you add up the effort – and this is certainly MENTAL EFFORT, not physical effort – involved in ticking off each of the targets on the ‘map’, well, it becomes a challenging journey. But again, what PIRATE would complain about the map that leads to buried treasure?? They wouldn’t be worried about HARDSHIP – they would only be worried that when they followed the map they FOUND THAT TREASURE. Creating a “PIRATE MAP” is great for all of us who are spending some time each week on fitness and performance – I mean, we all love the idea that in 12 short weeks we’ll have a bikini body, be in the best condition of our lives and be able to produce the “ultimate” performance (whatever that looks like for you). Unfortunately though, I have discovered – as many of you no doubt have – that the best laid plans don’t always work out exactly the way you want them too…and the reason is usually to do with the EXECUTION because, well, you know, life has a habit of getting in the way of plans. And even perfect plans don’t lead to perfect outcomes. Simply, if you really want to get ‘there’ (to the treasure), you need to continually refocus on your own personal PIRATE MAP. START. STOP. INCREASE. DECREASE. DONE.